The shrine of Kukke Subramanya is located in the Dakshina Kannada district of Karnataka and is one of the most well-known shrines in South India. The shrine is dedicated to Lord Subramanya, who is the son of Lord Shiva, and is considered as the commander of the army of the gods. The temple is located at the base of the Kumara Parvatha, which is a favorite destination amongst trekkers and is considered to be one of the most difficult treks in Karnataka. One can also find the river Kumaradhara flowing in the surroundings of the temple. By Air: Mangalore International Airport is the nearest airport, which is about 115 km away from here. It is connected to all the major cities in the country and to a few abroad. By Train: Subramanya Road railway station is connected to Mangalore, Bengaluru and major towns and cities of the country. The railway station is around 12 km from here. By Road: One of the best ways to reach Kukke Subramanya is by road. The town is well-connected by roads and there are regular buses which operate from major cities in the state to Kukke. For those who are opting to travel by Route 1, it would take you approximately around 5 h to reach Kukke, via Banadadka - Bengaluru Road. The route takes you through the well-known towns of Hassan, Sakleshpur, etc. The roads are well-maintained, which helps one to cover the distance at a good pace and the destination is about 280 km through this route. If you opt for Route 2, it would take you approximately 7 h to cover a total distance of 332 km from Bengaluru to Kukke, via NH 275 & Banadadka - Bengaluru Road. On Route 3, it would take you around 7.5 h to cover the distance of 327 km, via NH 275 to reach Kukke. Making a stopover at Nelamangala for a quick and yet filling breakfast of hot dosa that would give you all the energy you need until you decide to make the next stop at Hassan for lunch. Hassan was the seat of the Hoysala Empire; the place is named after the Goddess Haasanamba, who is the patron goddess of the town. The town is also home to famous sites of Belur, Halebidu, Sharavanabelagola and many other sites of archaeological importance. After a filling lunch at Hassan, one can proceed further down to Kukke, which is around 100 km and would take you about an hour or two to reach. Kukke Subramanya is located on the banks of the river Kumaradhara, and is a beautiful mixture of natural beauty and religious sanctity. The place has unparalleled and abundant natural features, the Kumara parvatha which stands tall forming a background to the temple is the best example to prove the natural beauty of this place. 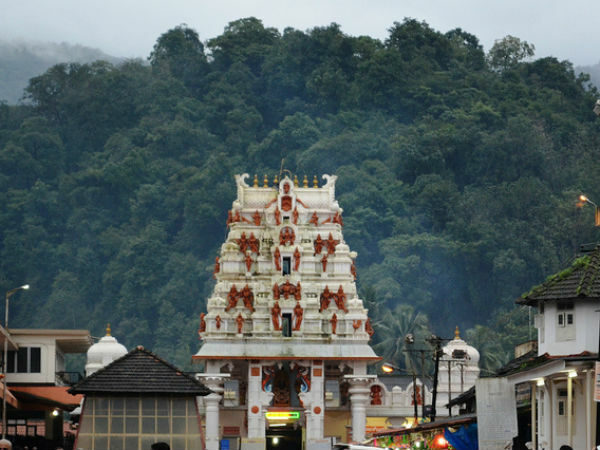 The Kukke Subramanya Temple is considered to be one of the seven Mukthi sites in Karnataka. As per the legends, after killing the demons Tharaka and Shurapadmasura, Lord Subramanya is said to have come to the Kumaraparvatha along with this brother Ganesha and others, where he was welcomed by Indira who offered his daughter's hand in marriage to Subramanya. While the wedding took place, the gods brought the water from several holy rivers to perform ‘abhisheka' to Subramanya and as the water fell down, it led to the formation of the Kumaradhara river. The temple is well-known for the worship of the snake deity Vasuki, and performing poojas at this temple is considered important for the removal of any sort of Sarpa Dosha or a Serpent's curse.